43- Parisien Flat Boulevards is located in the 2nd arr. District of Paris, a 13-minute walk from Opéra Garnier and a 14-minute walk from Louvre Museum. 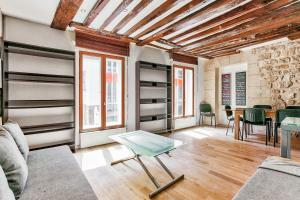 The property is 1.2 km from Pompidou Centre. The apartment comes with 3 separate bedrooms and includes a kitchen with an oven, microwave and dining area. A TV is available. Luggage service is provided at an extra cost. Popular points of interest near the apartment include Comedie Caumartin Theatre, Place de la République and Tuileries Garden. Paris - Orly Airport is 16 km away. This apartment has a toaster, kitchenware and electric kettle. Rate: € 217.50 ... € 426.64; select dates below to get current rates.